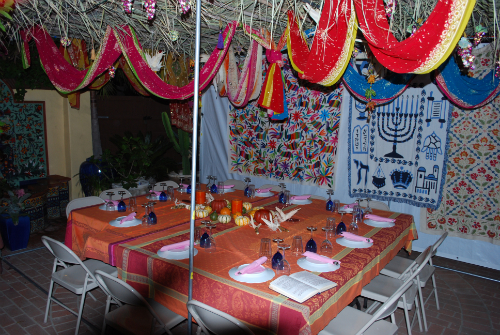 Every year my husband Michael and I build a Sukkah at our home in preparation for the holiday of Sukkot. Our first attempts in the early years, were no more then a rickety lean-to without a roof, only a few bamboo beams with some branches I collected from the neighborhood gardeners. Then, in another house, came the years of having a Sukkah frame of PVC pipe that fit together. My friend Sharon and I used to take our big SUVs to a park and fight our way through the clamoring hoards to grab a few palm branches, at no charge, as the City of LA was kind enough to arrange for all palm branches trimmed by the city to be deposited in one parking lot before Sukkot every year. Now days, we have become so sophisticated that I have my reusable, metal pipe, screw together Sukkah, that I have numbered in order ready for the handyman on the day after Yom Kippur when he comes to put it up. The next day B’nei Akiva delivers my pre-ordered and prepaid 35 palm branches and we have fun putting the Sukkah decorations up. Ever year I up the ante a little bit and try to improve on my decorating. This year the theme is a little India in the Kasbah. 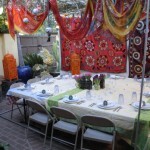 The picture is Sukkah 09. After all the work of building a Sukkah, I sure plan to use it so I invite people for dinner parties at least 3 of the seven nights. One night family, one night movie-group girlfriends and husbands, one night friends I have known forever, the gang. 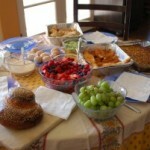 On the gang night, I serve an elaborate bits and bites buffet, including stuffed cabbage, Pastelicos, kufte de prassa, brisket, kibbeh senia, barbecue chicken thighs, rice, hummus, Israeli salad…. I never made stuffed cabbage until I married my husband Michael. I discovered that he loves it and his mom made the best. Unfortunately, she is no longer with us but I did have the foresight to have her show me and teach me her secrets. 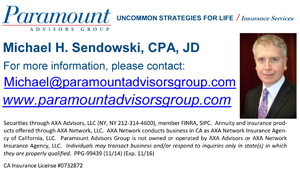 There are several important things to know. 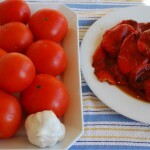 Stuffed cabbage should have a light sweet and sour taste, not overpowered by tomato or sugar. Placing sauerkraut in the bottom of the pan helps get the flavor right but it also acts as a buffer from the direct heat so the cabbage may simmer forever without sticking. With a sharp knife, cut around the core of each cabbage and remove it, leaving the cabbage whole. Fill a large stockpot with water. 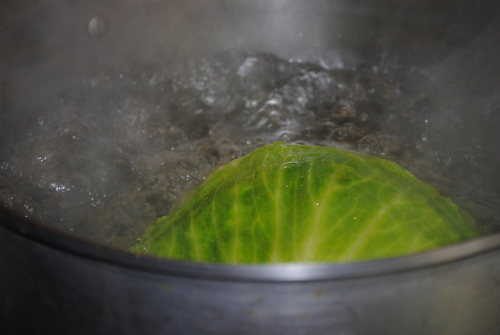 Bring the water to a boil then place cabbages one at a time in the boiling water, cover and let it cook for a bout ten minutes. 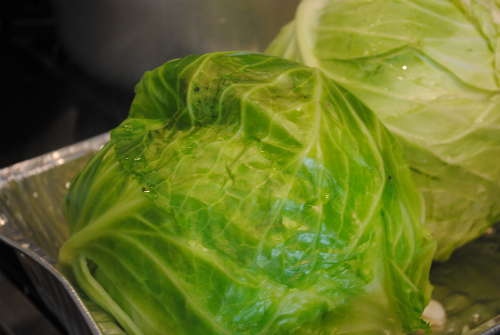 Remove the cabbage from the water to drain and place the next prepared cabbage in the boiling water. The cabbage must cook sufficiently, so that you can peel the individual leaves off without breaking them and the leaves should be pliable enough to roll. Let the cabbages drain and cool. In the meantime, prepare the meat. 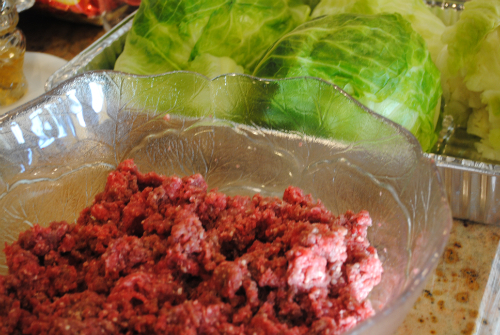 Combine the ground meat with salt and pepper, rice, tomato paste, and brown sugar. Once the cabbages are cool, peel the individual leaves off carefully so as not to tare them. Not all of the leaves are large enough to use in rolls, so set aside the centers of each of the cabbages when you reach the point of where they are too small. 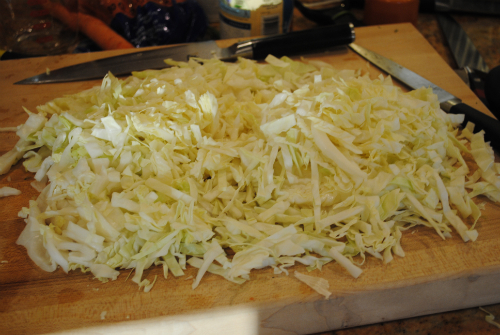 Chop all the non useable leaves as for cole slaw and stack the leaves to fill out on your work surface. 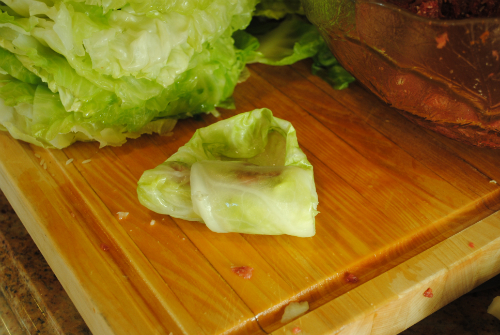 With a sharp small knife, remove the hardest part of the large center vein of the first leaf and set it aside. 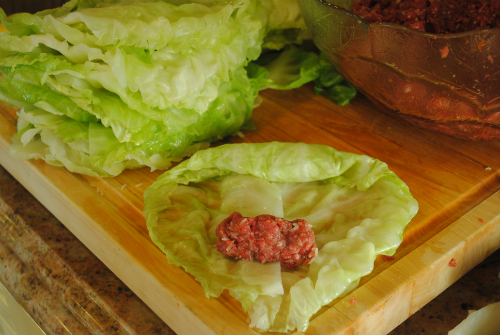 Put a little cylindrical ball of the meat filling in the center and then roll once, fold in the sides and continue to roll until the end of the leaf. 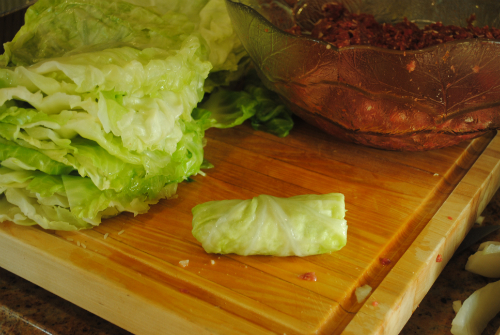 The cabbage roll should be secure, but not to tight, since rice in the filling expands during the cooking process. 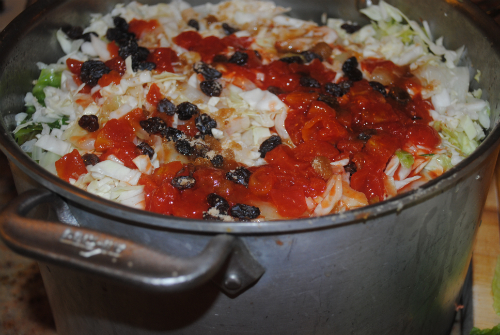 Place the sauerkraut in the bottom of a very heavy bottomed stockpot or Dutch oven. 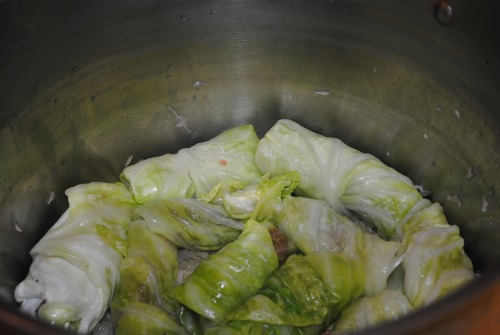 As you roll the cabbage rolls, place the completed rolls over the sauerkraut. 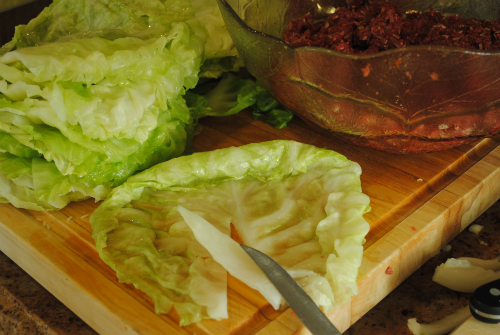 When the first layer is completed, cover it with a thin layer of the thin sliced cabbage. Next, sprinkle a few raisins on top. 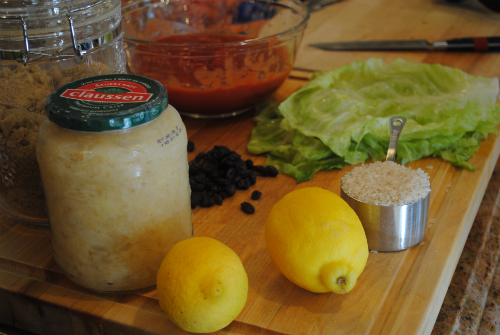 Combine all the ingredients for sauce in a pitcher and stir with a wooden spoon. Pour about ¼ of the sauce over the first layer. 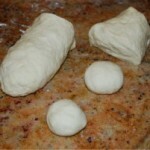 Repeat with second layer of rolls, thin sliced cabbage, raisins, sauce, then third layer and then fourth. Place your heavy bottomed stockpot on stove on medium heat with a tight fitting lit. When it is hot all the way through (it takes a little while), and it is simmering, turn it down to low and leave for about 3 hours. The more it cooks the better the flavors blend. You can freeze this in batches. It also keeps up to a third day in the refrigerator. 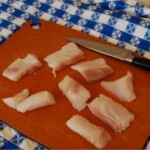 Be careful about reheating and leaving at room temperature so bacteria may grow. I hope you are having a wonderful holiday. Your menu for the bits and bites buffet is amazing. I will love to have your recipe for the kibbeh senia. I have made stuffed cabbage before, but never with the sauerkraut. I will be giving your version a try soon. 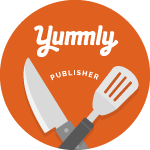 As always, thanks for sharing all your amazing recipes and pictures.